I’ve been living with a man who insulted me by word for 6 years. After we got married I’ve noticed that he could get too irritated for no reason. My husband became angry to the point that he could insult me by word, which was so poisonous for our relationship. To be honest, I had never faced such situations before, my parents have almost ideal relationship even now and I simply didn’t know how to react to such behavior. I had nobody to help me and I’ve made quite a lot of mistakes when trying to handle his temper. Luckily, we’ve overcome that terrible period and now I know what to do when my husband insults me by word. This is the most critical factor that determines the outcome of the quarrel. Once you give up and let your emotions out, the results may be much worse. Every time I used rude words in response, he got even more furious and uncontrolled. It’s really hard to pull yourself together and keep back everything you want to say at the moment. But remember that in intense situations people often say many unnecessary things they don’t mean at all. Psychology experts claim that you should talk in a calm, quiet manner. The opponent will have to calm down too, at least in order to hear what you say. For a long time I ignored my husband’s attacks and thought that it would pass. On the contrary, he started to criticize, mock at me and use rude words even more often. He liked to try my nerves and see how much I could stand. I’ve realized that tolerance of his insults was the worst thing that I could do. You can ignore the insults of some unimportant people like a rude assistant at the shop or a waiter, but when it comes to your close people, and husband in particular, tolerance is something you should strongly avoid. While humor is viewed as one of the best and most powerful ways to respond, I found it extremely difficult to use humor when my husband insulted me. The feeling of resentment was so strong that I just wanted to cry with rage. Can you imagine how it feels to make a pleasant face and start joking instead? However, this is exactly what you should do. The main thing about humor is that it undermines the power of rude words and relieves tension. Try to make a mockery by exaggerating the insult or adding something. Apart from ungrounded rude words, insult also implies criticism and sound judgment. Sure, this is no excuse for those who use insults, but from time to time it’s better to pay attention to the words. My husband’s words and opinion were important to me, and sometimes I found a great deal of truth in his rude words, even though they were painful. ‘You’re so messy! You’re good-for-nothing wife’ that’s what he told me one day when he entered the kitchen and saw the stock of dirty dishes in the sink and some leftovers on the table. You know, I started to be a more organized as for my household chores. No, I’ll never justify his behavior, but sometimes there was a part of truth in his rude words. You can use many tricks to handle your partner’s hot temper, but sooner or later you’ll get tired, just like I did. I couldn’t stand such behavior any longer so it was necessary that we have an open dialog and make things clear. I chose the moment when he was in a good mood and asked him to have a talk with me. To be more precise, I asked him to keep silent and not to interrupt. I told him everything I felt. I described my feelings and emotions and it seemed to work! He realized that words can hurt more that physical violence. When you decide to talk to the person who insults you, try to be as polite as possible. The conversation that is meant to reconcile you shouldn’t develop into a new fight. I know how hard it is, but try to be cool-headed and realistic. You don’t think that all those words he says are really true, do you? In most cases verbal abuse is more painful than physical one. Insults hit your sore point, ruin your dignity and self-esteem and diminish your importance as a person. While physical violence leaves scars on your body, an insult leaves scars on your soul. However, try to distract yourself from the insults and don’t take them too personally. I mentioned that sometimes you should take your husband’s word into account, but you should see the difference between a pure insult and a sound criticism. It always works and gives desirable results. When I saw that he was getting angry and started insulting me, I just left him alone under any pretext. This is really simple and effective way to handle your partner’s anger. Say with a serious face that you have an appointment and leave him alone. Say that you need to help your children with homework, work in the garden or think up anything that enables you to leave the room. Be sure your partner would be rather disappointed and puzzled. Don’t mock or play the fool. It’s important to look serious and significant. Someone would say that quarrels and insults are an integral part of any relationship and they cannot lead to any consequences. But when you feel that your beloved goes too far, you shouldn’t tolerate that. Word abuse is as harmful as physical one, even though it’s not so visible. 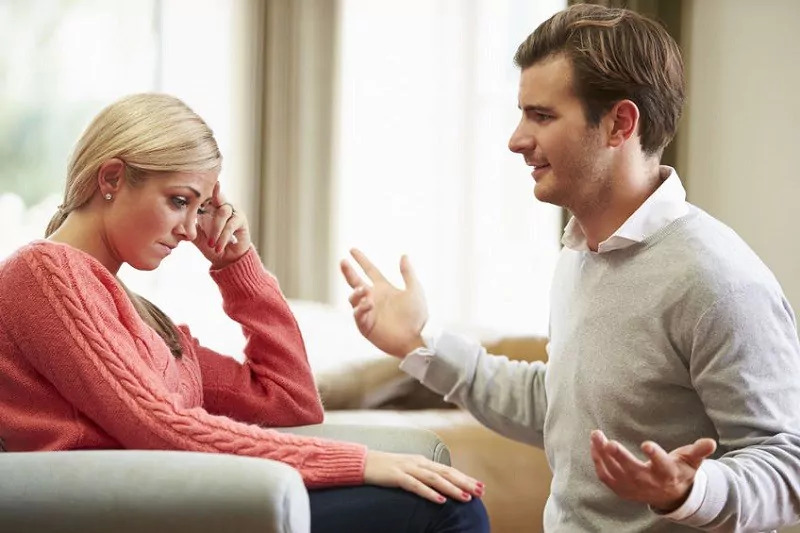 I hope my experience will help you to handle your partner’s anger and insults.